Basal cell carcinoma is a cancer that grows on parts of your skin that get a lot of sun. It’s natural to feel concerned when your doctor tells you that you have it, but bear in mind that it’s the least risky type of skin cancer. As long as you capture it early, you can be cured. This cancer is unlikely to spread out from your skin to other parts of your body, but it can move close by into bone or other tissue under your skin. Several treatments can keep that from taking place and get rid of the cancer. The tumors begin as small shiny bumps, generally on your nose or other parts of your face. But you can get them on any part of your body, including your trunk, legs, and arms. If you’ve got reasonable skin, you’re most likely to get this skin cancer. Basal cell carcinoma generally grows really gradually and often doesn’t appear for many years after extreme or long-lasting direct exposure to the sun. You can get it at a younger age if you’re exposed to a great deal of sun or use tanning beds. Ultraviolet (UV) rays from the sun or from a tanning bed are the primary cause of basal cell carcinoma. When UV rays strike your skin, gradually, they can damage the DNA in your skin cells. The DNA holds the code for the way these cells grow. In time, damage to the DNA can cause cancer to form. The process takes several years. Basal cell cancer can look various. You may observe a skin development in a dome shape that has blood vessels in it. It can be pink, brown, or black. Initially, a basal cell cancer turns up like a small “pearly” bump that appears like a flesh-colored mole or a pimple that doesn’t go away. Often these developments can look dark. Or you might also see glossy pink or red patches that are somewhat scaly. 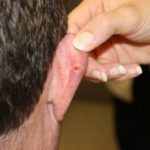 Another symptom to keep an eye out for is a waxy, hard skin growth. Basal cell cancers are also delicate and can bleed easily. 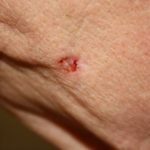 Have you had uncommon bleeding spots on your skin that do not recover? Your doctor will take a sample, or biopsy, of the development. He will numb the area and remove some of the skin. Then he sends it to a lab, where it will be tested for cancer cells. What kind of treatments do you suggest? Can drugs assist treat my condition? How can I avoid getting skin cancer once again? The goal is to get rid of the cancer while leaving as small a scar as possible. To choose the best treatment, your doctor will consider the size and place of the cancer, and how long you’ve had it. He’ll also take into account the possibility of scarring, as well as your total health. Cutting out the tumor. Your doctor may call this an “excision.” First he’ll numb the tumor and the skin around it. Then he’ll scrape the tumor with a spoon-shaped device. Next he’ll cut out the tumor and a small surrounding area of normal-appearing skin and send it to a lab. If the lab results program there are cancer cells in the area around your tumor, your doctor might need to remove more of your skin. Scraping the tumor away and using electricity to eliminate cancer cells. You might hear your doctor call this “curettage and desiccation.” First your doctor numbs your skin. Then he uses a curette, a tool that has spoon-like shape to remove the tumor. Your doctor manages your bleeding and kills other cancer cells with an electric needle. Freezing your cancer cells. This is called “cryosurgery.” Your doctor eliminates your cancer cells by freezing them with liquid nitrogen. Radiation therapy. This treatment uses X-rays to ruin your cancer cells. It’s done over numerous weeks. Mohs surgery. This is a technique that’s called after the doctor who invented it. Your surgeon removes your tumor layer by layer. He takes out some tissue, then takes a look at it under a microscopic lense to see if it has cancer cells, prior to carrying on to the next layer. You might have to use these creams for a number of weeks. Your doctor will inspect you frequently to see how well they are working. There is also a tablet that your doctor might prescribe called Erivedge (vismodegib). You’re probably to get this drug if your basal cell carcinoma has infected other parts of your body. After you’ve been treated for basal cell cancer, you’ll need to take some actions to reduce your chance of getting cancer again. Check your skin. Watch out for brand-new growths. 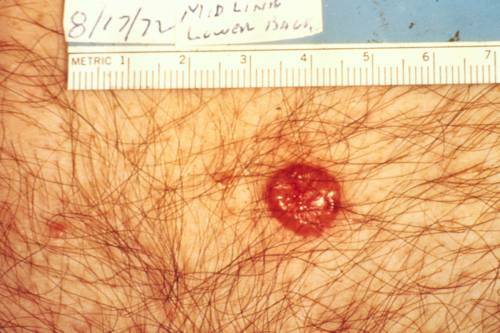 Some signs of cancer consist of areas of skin that are growing, altering, or bleeding. Examine your skin routinely with a hand-held mirror and a full-length mirror so that you can get a good view of all parts of your body. Prevent excessive sun. Stay out of sunshine in between 10 a.m. and 2 p.m., when the sun’s UVB burning rays are strongest. Use sunscreen. The sun’s UVA rays are present all day long – that’s why you require day-to-day sun block. Make sure you apply sun block with at least a sun security aspect of 30 to all parts of the skin that aren’t covered up with clothes every day. You likewise have to reapply it every 60 to 80 minutes when outdoors. Dress right. Use a broad-brimmed hat and cover as much as possible, such as long-sleeved t-shirts and long pants. Basal cell cancer seldom infects other parts of the body, and the treatment is usually successful, particularly if it’s caught early. Often brand-new carcinomas can grow, so it’s essential to check your skin for any unusual-looking developments and get them checked by your doctor.